For the Horchata In a 2 quart saucepot over medium high heat combine 3 cups of water, cinnamon stick, cloves and vanilla. Cover and bring to a boil reduce heat to low or cook about 10 minutes. Stir in sweetened condensed and evaporated milk and cook 5 minutes then remove from heat. Stir in sugar. In a small bowl, mix rice flour with 1 cup of water using a fork or whisk. Stir flour and water mixture into the milks mixture and let it sit for at least 30 minutes in the refrigerator. Using cheese cloth or fine sieve, strain the liquid into a pitcher or other container. How to Make a Granita Pour liquid into a 9 x 13 inch metal baking pan and place on an even surface in your freezer. After 30 minutes, take pan out and scrape granita with a fork, loosening all of the frozen sections. Place the pan back in freezer and repeat this process two more times. After 1 and 1/2 hours, scrape the granita into bowls, sprinkle with cinnamon powder, and serve immediately. Make the horchata up to 2 days before you plan on making the granita. Granita can be a fun and easy way to involve kids in the kitchen. I’m not Mexicana, but growing up, my church community was. I learned to appreciate Mexican food at an early age. A few of my favorite Mexican foods and beverages are part of my regular menu rotation, but others I hesitate to make because of the time needed to prepare them. Horchata is one of them. I can’t go into a Mexican restaurant and not order a glass of horchata. It’s a sweet and refreshing compliment to the spiciness of the food. I have been making a lot of sorbets and ice creams in the last year and had the idea of making horchata granita (similar to shaved ice or a snow cone) because it does not require an ice cream maker. 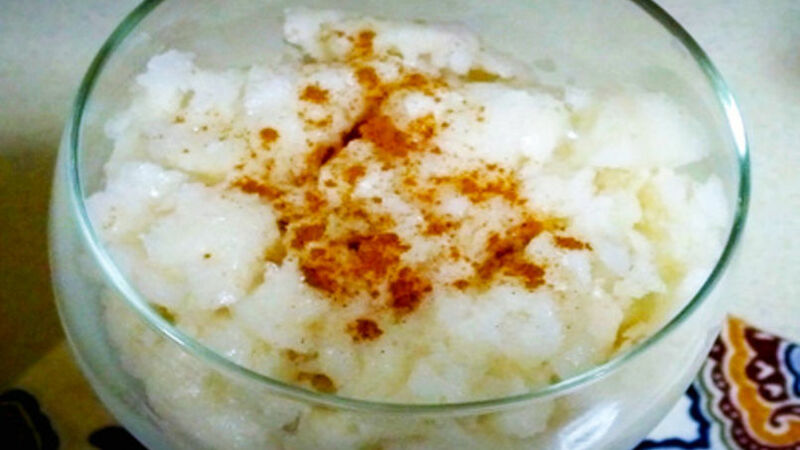 My horchata recipe uses rice flour as a short-cut to having to puree whole grain rice several times in a blender. I also add milk in order to provide a creamier consistency to the granita. Feel free to replace your horchata recipe with mine. My recipe is meant to capture the flavor of traditional horchata while cutting down on the preparation time, especially since converting it into a granita takes some time of its own.